The Rebel Sweetheart. 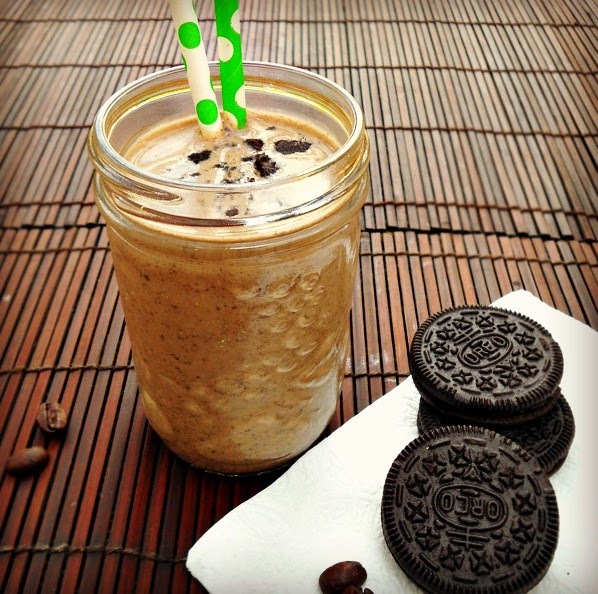 : Foodie Goodie | Oreo Coffee Smoothie. On regular days, I like munching on Oreo cookies while sipping a cup of my favorite coffee. But on an awfully hot day like today (it's 33 degrees outside, my goodness! ), I'd prefer to have something cold and refreshing. Something like an Oreo Coffee Smoothie - the perfect way to cool off in this sweltering heat! 1. Crush one piece of the cookies into fine crumbs; set aside. 2. Place yogurt, milk, chocolate syrup, coffee, and remaining 8 cookies in blender container. Cover, and blend until smooth. 3. Pour evenly into 4 glasses; top with whipped topping and the reserved cookie crumbs. This sounds so good indeed and I will be making this smoothie for sure. I love coffee anything. Thanks for sharing. Oreo Coffee Smoothie... You seriously took all of my all-time favorite things and put them into one drink I need to have in my life! I adore smoothies, oreos and coffee, so why not? Can't believe it never crossed my mind to try this before! WOW! How have I never thought to make this before!!! That's a lot of good flavors mixed into one drink. I'd love to try it! That looks so good. Can't wait to try it! I just love all the things you can make with Oreos! I am dreaming, This looks awesome.